What are the Effects of Sleep Deprivation? Given the demands of modern life it's hard to escape the effects of sleep deprivation. It is too easy to neglect our sleep habits. More and more pressure is put on people to perform and there just never seems to be enough time in the day to meet our obligations. 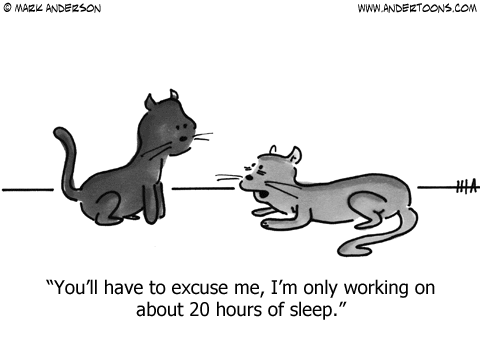 The quick and easy solution (albeit short-sighted) is to just steal a few hours from the sleep bank. While we may be very disciplined about other aspects of our lives that affect our health like being sure to get enough excercise or eating healthy, it is often sleep that is neglected despite it's major impact on both our physical and mental health. The effects of sleep deprivation can also be relatively swift. While sleep is necessary for the regeneration of cells throughout the body the most important and most quickly affected are brain cells. Other cells like those in muscle tissue can regenerate to a certain extent while you are relaxed and not fully asleep but brain cells need the deeper levels of sleep to recover. You know this from your own experience and have seen how speech becomes slurred, thinking processes slowed, concentration lost and creativity blunted as a result of lack of sleep. Since the brain requires sleep to regenerate itself the effects of sleep deprivation are keenly felt and result in immediate and long-term observable consequences. The temporal lobe of the cerebral cortex is used for language so processing of verbal information and speech function is one of the first things impacted. The ability to quickly and accurately process language is affected and speech becomes slurred. Interestingly, it seems that another part of the brain, the parietal lobes step in to help process this information but don't do as good a job as the temporal lobe and language skills are still reduced. However, since this region of the cerebral cortex is related to short term memory and sleep deprived individuals are now using this part of the brain there may be some improvement to short term memory function during this time. When it comes to thinking creatively sleep deprivation results in blunting your ability to come up with clever ideas and solutions. Sleep deprived individuals will tend toward solutions that have already been done before, but it's worse than that... they will use easy solutions that may not necessarily even be appropriate given that the problem they are attempting to solve may be different from when the solution originally worked. Given that the prefrontal cortex is used for judgement, impulse control, mental focus and making visual associations it is easy to see how the quality of our mental processes and the resulting decisions we make would be better left to a day when we are better rested. This mental laziness (or haziness) translates into the physical realm as well. Another of the effects of sleep deprivation you may have noticed is an intolerance for activity. Our mental function is blunted and our physical motivation to "do things" is also dramatically lowered. We may not be able to sleep but we are also too tired to do anything else. In this way it is really a false economy to cut corners on sleep in order to get more work done as productivity, creativity and quality is dramatically lowered. Better to sleep an extra hour or two and be able to perform than to skrimp on sleep and drag yourself through the day. Why do we hallucinate as a result of sleep deprivation? Our brains work for us to try to create a semblance of the reality around us. Everything we experience is really just an interpretation of the inputs our brain receives from the world around us. When you are suffering from the effects of sleep deprivation your brain is struggling to keep providing a rational interpretation of reality. However, the more sleep deprived you are the more the neurons in your brain are struggling and the more "unreal" the projection of reality provided by your brain will become. This can even lead to temporary insanity if you don't get the REM sleep cycle the brain and especially the prefrontal cortex needs. While your brain, perceptions of reality and thought processes are impacted by the effects of sleep deprivation your body and immune system are not spared. The result of these effects are to lower your ability to fight off infections and make you susceptible to illness. Given other health factors including age (very young or old) and this can contribute to conditions that result in severe illness or death. Lack of sleep is also implicated in increased heart rate variability (HRV). This can be of particualar concern to patients whose lack of sleep is related to sleep apnea. Due to reduced levels of oxygen the heart and brain can suffer further damage and disruption of function. As if there weren't enough ways to cause us to gain too much weight. Yes, one of the effects of sleep deprivation is weight gain! While it is possible to lose weight it is common to gain weight as a lack of sleep primarily due to the influence that sleep has on hormone production. For example two hormones that come into play are leptin and ghrelin. Ghrelin causes you to feel hungrier and leptin influences how satisfied you are. Unfortunately, without proper sleep leptin levels decrease and ghrelin levels increase so you wind up eating more and feeling less satisfied. Another factor causing weight gain is that with the less sleep we get the less able we are able to deal with stress. As stress levels rise so do the stress hormones like cortisol. Cortisol can cause you to crave carbohydrates which creates the perfect recipe for weight gain. Chronic sleep deprivation, as well as excessive sleep, may also lead to diabetes according to a study done at the Boston University School of Medicine. Conclusions were that "A sleep duration of 6 hours or less or 9 hours or more is associated with increased prevalence of DM (diabetes mellitus) and IGT (impaired glucose tolerance). Because this effect was present in subjects without insomnia, voluntary sleep restriction may contribute to the large public health burden of DM.